Tag Archive | "College Rankings"
Over the years we’ve come to the belief that a college degree is vital for any young person who wants a better life than their parents, and in a way this has become the American Dream… for each generation to improve on the last; to enjoy a better education and a higher income than those who went before them. It’s a nice idea, but the truth is that all colleges are not created equal. There are, of course, the exclusive (and expensive) colleges of the Ivy League, rich in history and known (perhaps inaccurately) for the virtual certainty that a degree carrying their name will lead to a successful career. Then there are the mid-level colleges, respected but without the cache and weight of the Ivy League, and finally the lowest of the low: the community colleges and correspondence schools that offer degrees to those students who have neither the grades nor the money to go to a big name institution. The ranking of schools may seem simple, but in fact the only metric worth paying attention to is the return on investment (ROI) they can offer. The ROI is based on the earnings statistics of past graduates, and it tells prospective students just what kind of income boost they can statistically expect their degree to offer. Here, then, are four private colleges that may not have appeared on your radar, but should. The following are some of the most highly ranked but least expensive colleges in the US; institutions that offer an education that will give graduates the best chance of moving into a successful career, but without the overwhelming cost we’ve come to expect from higher education. This Roman Catholic Liberal Arts college based in the Bronx costs a hair under $50,000 per year before financial aid, a cost covering everything from tuition to room and board to the dorm damage deposit, and it offers the highest ROI of any college under $50,000/annum according to a 2012 PayScale report. Students of Manhattan College can expect an average 30 year ROI (net) of a little over $800,000, which makes a degree from Manhattan a highly attractive prospect – especially when financial aid brings down the cost of tuition considerably. As one of the least expensive private universities in the US, Brigham Young offers Utah’s Mormons a great chance to secure a good education without breaking the bank. Tuition is discounted for religious students in the Mormon stronghold of Provo, Utah, though non-Mormons can still get a good deal. The upshot of a degree from Brigham is an ROI of $468,000 over 30 years, which is excellent considering that annual tuition begins at just $12,800. Berea College in Berea, Kentucky, will come as a Godsend to those who simply can’t afford the cost of any other institution. Berea has made its name as possibly the most inexpensive private college in the US with a total annual cost – before financial aid has been applied, and including tuition, accommodation and the cost of textbooks – of a rock bottom $7,646. 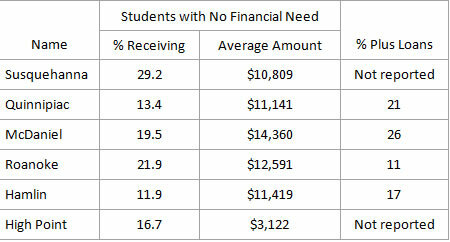 With need-based aid, the average student pays just $2,641 per year to attend this four year college. Forbes ranked Berea as the #7 ‘best buy’ college in 2012, falling just beneath a number of military academies (including West Point) that don’t charge tuition but expect graduates to serve in the military in return for their degree. Much as it may surprise you to learn, some of the most exclusive colleges in the US offer tuition that isn’t a whole lot higher than average, and many offer financial aid packages superior to even the most generous institutions. While Harvard accepts just a lucky 6% of the brightest applicants, if you make it to the hallowed halls of Cambridge you’ll find that, while tuition can cost $55,000 each year, when the generous need-based financial aid package has been added, the net cost of tuition is an average of just $13,267. Since Harvard graduates enjoy an average 30-year return on investment of $1,115,000, an investment in tuition over four years of just $53,000 seems like chicken feed. There’s no getting around the fact that a college degree is expensive, and it’s only becoming more so as we cut back on financial aid and institutions raise their fees above inflation each year. However, you should take heart in the fact that even a college such as Harvard needn’t be out of reach for a student who puts in the effort to earn their place. From Berea, Kentucky to Cambridge, Massachusetts there’s ample opportunity for everyone who yearns for a brighter future. All it takes is hard work. Today’s guest article comes from Sani Golriz. She is a community blogger and active staff writer for CollegeFocus, a website dedicated to helping students deal with the challenges of college, including housing, finance, style, health, relationships, and transferring from a community college to a four-year university. You can follow CollegeFocus on Twitter at @CollegeFocus101 and Facebook. Colleges and Universities provide a lot of “warm and fuzzy” moments and opportunities for their students, alumni, families, and friends. College is about those memorable moments just as much as it is about academics. However, at the end of the day, the back room operations (often not seen by the general public) dictate that a college make decisions and establish processes that ensure it’s existence for decades to come. As much as we would like to think a college or university is different from any other type of business, it really isn’t. They have the same revenue and expense challenges/successes that you find in corporate America and they must maintain a solid balance sheet on their financial statements. If you’re trying to figure out how to pay for college, it’s time to make the college ranking madness work for you. While nobody advertises that they’re trying to improve their positions in the US News College Rankings, most colleges are willing to offer money to students who have characteristics that will help improve their rankings. In other words, high test scores, GPAs, and class ranks can qualify you for merit money. Many schools now have scholarship calculators on their websites to estimate how much you will qualify for just based on your GPA, class rank, and test scores. The University of Dallas estimates a merit scholarship of $14,000 for a 3.5 GPA and 1200 SAT. Southwestern University has a table showing how much you qualify for. A 1200 SAT and 3.5 will get you $11,000. In general, merit money is found at private colleges. However, there are some state schools that will admit out-of-state students with scholarships or for in-state tuition based on grades and test scores. Furthermore, high test scores can qualify you for honor programs at state universities that can provide you with unique academic opportunities. These will probably not be the public universities with the highest rankings but you should still receive an excellent education. The key to getting the money is to find the schools where your test scores put you in the top quarter of the freshman class. This means you won’t be applying to the topped ranked schools. They’ve already got the numbers they want, they don’t need to offer any incentives. But while you may not buy into the rankings, you do still want to ensure a good education. Unfortunately, good is often in the eye of the beholder. However, if you’re willing to do a little research, you can probably find the right school for the right price. The trick is to narrow down your search. You already know that you’re going to have to choose schools where your test scores are in the 75%. The next thing to do is to eliminate schools will low graduation rates. After all, graduation is the most basic goal of college. And while a low graduation rate doesn’t automatically mean that the college is doing a poor job of educating their students, it’s certainly a reasonable one for parents footing the bill to consider. This data is available through the Integrated Post-Secondary Education System (IPEDS) that is used for the College Navigator website. You can use the Download Custom Data Files option to get a list of colleges to use as your starting point. If you use the following requirements, you would generate a list of 281 college. It might sound like a lot but it really isn’t when you consider you haven’t made any decisions about size, location, or availability of majors. Once you narrow the list to schools that meet your minimal requirements, you need to start looking into their financial aid in more detail. Some of this information is available through IPEDS, including the percent of freshman receiving institutional grants, the average amount of the grants, average net cost after grants, and percentage of freshman receiving non-federal student loans. The following information if for six of the schools that show up in the search results. The IPEDS information doesn’t split out Institutional Grants by those with need and those without. You can look up the colleges on the CollegeData.com website and find out how many students without financial need received merit awards and for how much. You can also see what percentage of graduates have loans and for how much as well as the percentage of parents ended up taking out PLUS loans. The site also lists the average GPA and test scores of the freshman class which can further refine your search. 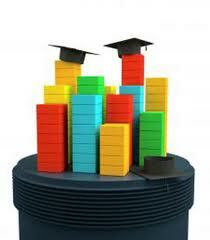 Of course, the better your scores, the wider range of school you can start with in your pool. If you up the SAT scores to 650 each then you have over 400 schools to start with. In such a case, you might increase your graduation requirement to 45% which would narrow your pool to only 244 schools. The point is that if you change your attitude from “what are the highest ranked colleges I can get into” to “what colleges want me to help improve their rankings,” you’ll considerably improve your chances for merit scholarships. Today’s guest article comes from Michelle Kretzschmar. Michelle blogs on how to find a college with a focus on using data to make the best choices possible. She created her own spreadsheet to target the best colleges where her son could study history and play baseball. She has a step-by-step description on how to download IPEDS data at her website DIYCollegeRankings.com. Holding true to the Higher Education Opportunity Act legislation, the Department of Education has started it’s own ranking system for colleges and universities. It is called the College Affordability and Transparency List (or CATL for short). The government has always asked colleges and universities to report statistical data (including costs) every year through the IPEDS survey (Integrated Post-secondary Education Data System) but this is the first year that the financial data will be made widely available for families to sort through, compare, and contrast based upon specific criteria. The purpose of this list is aimed at highlighting the schools that have the highest prices AND the highest rate of price increases. Schools at the top of this list for the three year period preceding the release of this list will be required to submit additional reports to the Secretary of Education. From what I understand, over 500 colleges will be required to execute the additional reporting piece this year. The statistics of the data being presented are a little shocking (maybe even mind-numbing) but numbers don’t lie and usually speak for themselves. Should you use this data to help you in your college search process? Maybe, but I would probably advise against it. These numbers are already a couple years old and since they provide a statistical average, your individual financial outlook at one of these colleges may actually be better or worse than the average. Below are a few different categories that I pulled from the CATL report. If you would like to play around with the data and run your own reports or check out your favorite college or university to see where it stands amongst the others, click here to give it a whirl. 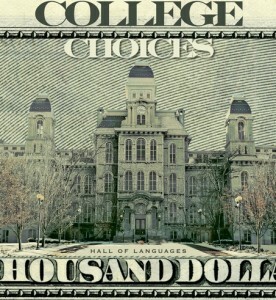 The Princeton review recently released a report reflecting 100 of the Best Value Colleges for 2011. The list represents the top 50 Public and top 50 Private colleges in the nation that are recognized for their value. You have to keep in mind that this (value) doesn’t necessarily mean that they are cheaper. It does, however, reflect that these schools are implementing strategies to keep tuition costs at a minimum and student loan debt as low as possible. 1. Swarthmore College, Swarthmore, Pa.
2. Duke University, Durham, N.C.
5. Harvard College, Cambridge, Mass. Going to college can be challenging but having a physical disability and going to college can be an entirely different experience all together. Fortunately, I have had the opportunity to witness a number of college campuses across the nation equip themselves to be “disability friendly” over the years in hopes of increasing the accessibility of their programs to ALL students. The following is a scholarship program for the legally blind and the results of a recent study utilized to rank college websites and their ability to meet the needs of blind students. Hope you find this information helpful. The National Federation of the Blind (NFB) is starting to accept applications for the 2011 scholarship season. The value of this scholarship could be from $3,000 to $12,000. In addition to the scholarship, each recipient will receive assistance to attend the annual NFB convention held in July. must participate in the entire NFB national convention and in all scheduled scholarship program activities. If you would like more information about this scholarship opportunity, you can contact Chairperson Patti Chang via email at scholarships@nfb.org or call (410) 659-9314 ext. 2415. You can also find answers to frequently asked questions here. The federal government has already mandated (ADA 1990) that every college in the nation receiving Title IV funding (Federal Financial Aid) make deliberate attempts at being as accommodating as possible when it comes to legally blind students. Most colleges have met or exceeded expectations in this area but my guess is that there is still probably room for improvement on some campuses. 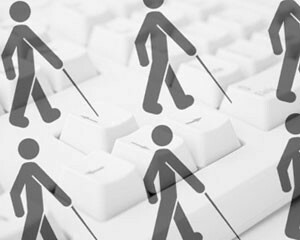 Jon Gunderson is employed as a coordinator of assisted communication and technology at the University of Illinois and he recently completed a research project to identify the best and worst college websites for blind students. His study examined over 183 institutions (and their accompanying websites) and utilized the following criteria to provide an overall ranking score. 1. The Web site must have text where a browser’s text reader will pick it up. The same must be true for all Web pages on the site. 2. All additional headings on a page must contain text, and font sizes need to be ordered largest to smallest, consecutively. 3. All elements of online applications need to be properly labeled so that text readers will find them. Such elements include: password boxes, radio buttons, file buttons, check boxes, “select” buttons, “submit” buttons, and “reset” buttons. 4. If you use a table to display information, include proper tags in the cells: “th” tags to indicate categories and “td” tags to indicate data. 5. If there is a picture included anywhere on the Web site, there should be text, coded for text readers, describing the picture. 6. Tables should be used only for organizing data in rows and columns. If you are designing a Web site, use a cascading style sheet instead of a table. Based upon this research, the following is a ranking of the top ten schools and their “Blind Friendly Score”. My hunch would be that the schools at the top of this website ranking would also be a great match for a legally blind student. However, an excellent online environment doesn’t necessarily dictate a blind friendly campus environment – so take these ranking with a grain of salt. I don’t know about you but I really enjoy checking out statistics on a number of topics but I tend to gravitate toward higher education facts and figures just because it is an area in which I can relate on multiple levels. I recently came across a compilation of college statistics that were put together by OnlineSchools.org and I thought it would be worth sharing with you. Some of the stats are humbling but others are pleasantly enlightening. 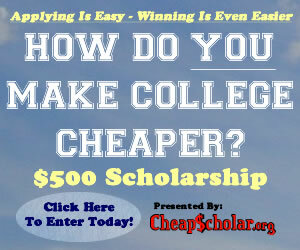 Staying on topic with CheapScholar.org’s mission, check out the facts and figures below related to college costs.